As another top ten seed in Petra Kvitova departed the tournament, Serena Williams’s chances of prevailing at this year’s Australian Open received another boost. In my opinion, this match-up against Muguruza will be the defining match of her Australian Open. If she wins it, i’d fancy Serena to win the whole caboodle. Poll Results for Saturday’s matches: 59% correctly predicted that Venus would beat Giorgi, 63% correctly predicted that Radwanska would beat Lepchenko, 70% correctly predicted that Serena would beat Svitolina, 56% correctly predicted that Cibulkova would beat Cornet, 69% correctly predicted that Azarenka would beat BZS and 31% correctly predicted that Keys would beat Kvitova. In a match shrouded with intrigue and fascination, Garbine Muguruza and Serena Williams will play each other for the first time since their French Open clash last year. On that day, Muguruza defeated Williams, 6-2 6-2 with a barrage of penetrating groundstrokes. For the past two matches, Serena Williams has made sluggish starts. Against Vera Zvonareva, she saved three set points before winning 7-5 6-0. Serena lost her first set of the tournament against Elina Svitolina, but turned it around to finish with another bagel in a 4-6 6-2 6-0 win. It’s hard to really gauge where Serena’s form is at after the first three rounds. Like Serena, Garbine has scored a bagel in each of her first three rounds and furthermore, finished all of her matches with bagel sets. In the third round, Muguruza beat Timea Bacsinszky, 6-3 4-6 6-0. We did see at Wimbledon though that certain players have their way against Serena… Last year, Serena was my predicted champion at all four Slams, but after her disappointing performances at the Slams in 2014 and her start to the year, i’ve felt much uncertainty surrounds her. For me, this is either Muguruza in 2 or Serena in 3. I’m going to honour my original prediction and take a risk in siding with Garbine. I really believe that Muguruza is good enough to create the upset again and if she can maintain the tactic of hitting deep down the centre and serve well, she’s going to cause Serena problems. 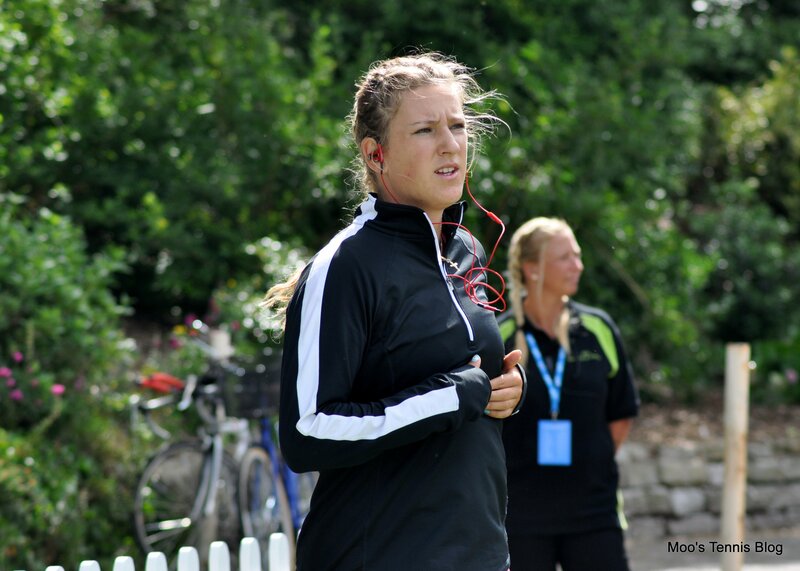 Victoria Azarenka defeated Barbora Zahlavova Strycova, 6-4 6-4 to book her place in the last 16. This performance wasn’t as convincing as her win over Caroline Wozniacki in the second round, but she got the job done holding her serve in the final game of a break-happy match that featured 10 breaks of serve in just 20 games. Where Azarenka succeeded at the net against Wozniacki, she wasn’t as clean in this department against BZS. However, this is a good match-up for Vika as her penetrating groundstrokes consistently pushed Zahlavova Strycova back behind the baseline, not allowing her as much freedom as normal to implement her desired gameplan. BZS, who spent most the second set on the floor, had a horrendous miss with a regulation volley in the final game that could have seen the match have some extra legs. Azarenka will face the 2014 Australian Open finalist, Dominika Cibulkova in the fourth round. Domi couldn’t have asked for much more this week after dropping the opening set of her first round match against Kirsten Flipkens. She saved set points in the first set of her third round match against Alize Cornet, but progressed in straight sets, 7-5 6-2. Azarenka and Cibulkova have had some feisty previous encounters; in their most recent match, Cibulkova pomed her way to a straight sets win, 6-2 7-6(4) at Roland Garros in 2012 in what was a wickedly intense match. It was a huge win for Cibulkova after she had blown a set and a double break lead in Miami a few months prior to RG. Their previous matches have been good so I have high hopes this will be a great watch. No real reasoning, but I have more faith in Vika coming through. You know my thoughts on Serena vs Garbine… I think a) Serena is going to be looking for some serious revenge and b) Garbine is going to be feeling the pressure of backing up her FO win. The only time Serena hasn’t completely battered a player trying to beat her twice in a row was with Alize Cornet at Wimbledon and Serena was just *odd* in that tournament. Not in the form she showed against Svitolina or Zvonareva. Cibulkova vs Azarenka is tough. I voted the latter, but the former could definitely push her for the win. You voted for Serena or Gab, you can’t pick both. Serena will school Gab. See how Serena and Vee bagel her in doubles. Maybe you should have waited until the match was finished LOL. I definitely agree with a), but not so sure about b). I don’t think there is any pressure on Garbine to back it up, i’d say it was more on Serena. Muguruza is still the underdog in this match-up and I think Serena is still the favourite to come through. Serena thrives under pressure. It’s when she gets complacent in her chances of winning that she tends to lose. I still think Muguruza is going to be feeling really nervous about trying to repeat the performance of last year and it’ll show, particularly in her service games. So because she beat Serena once, that mean she will beat her again. Serena will beat this girl down and she will not be in top 10 no time soon. And Serena beat her before 61_60. This reminds me of when Solane beat Serena at AO quarter finals. And she had to play her at the US Open fourth round, Rena put all the haters to rest. And beating Serena doesn’t mean anything unless you win the title. And when was the last time Petra beat Serena or dominated anything? I see Serena I pick Serena. This is a match I have been waiting for since that incredible win for Garbine at FO. If Serena has revenge on her mind and comes out on top form then Garbine will have to match her. The first set is crucial for both players i belive. IF Serena loses the first set , Garbine will be too strong and won’t falter like Svitolina did. I don’t think Muguruza (or anyone, for that matter) is able to match Serena when she plays her best. Svitolina is going to be a world class player one day and she didn’t actually do a single thing wrong… Serena Williams is just unplayable when she’s switched on. Well she lost! And Serena did lost the first set and she wore her out the two other set. I see Serena coming through unless Garbine has a good back-up plan. If she follows the plan of down-the-middle, it is highly likely that Serena will have an answer prepared this time. Look how she turned the tables on Simona in Singapore. Garbine will feel the pressure of closing as well. I dont think she will be able to stand up to it. I think Vika will win. Domi has had a good run. It’s good for her to banish her demons of latter half of 2014. But Vika is hungry and playing good. Unlike Maria, Vika doesnt lose track of the plot midway through the match. All good points. I am so intrigued by the Serena-Garbine match! My only worry about Muguruza is that she has lost some unnecessary sets where she should have saved energy. Having said that, the chic is strong, determined and brutal. Does not make too many unforced errors once ball is in play. Serena is now fragile and does not wear her invincibility mode no more. Certainly over 18.5 games with a reasonable tilt towards another upset. Go on Ruza!!!!!!!!!!!!!!!! It was a good match and another slow start for Serena, but she step up at the end. Azaranka match was great also. The top draw has all the must see matches. I hope Venus can make it to the semi, that will be an amazing come back story. I hope she is hungry like Serena.